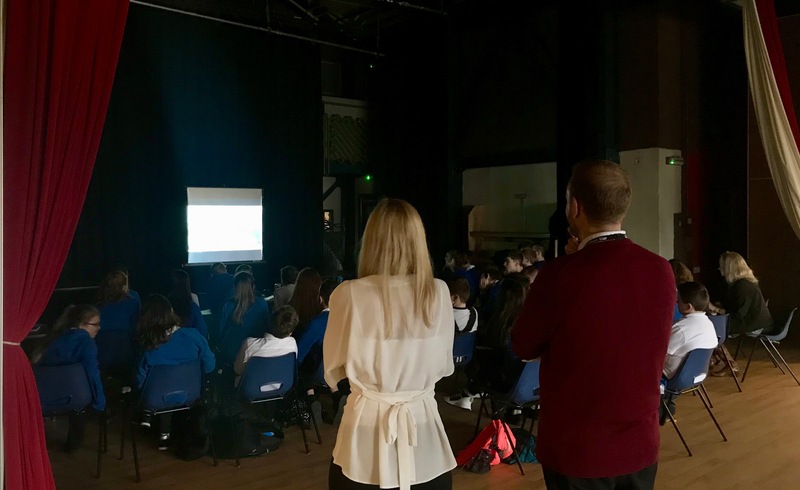 Made by the Sea is a filmmaking project created by Shona Thomson and myself to use archive footage as a stimulus for the creation of new films by schools and community groups. It follows Shona’s original Made by the Sea project, funded by the BFI and screened in the Screen Machine in communities across Scotland. Each community saw reflections of their own past through archive footage sourced by Shona from a diverse range of sources. Our current MbtS project is running in Ullapool, Barra and Tobermory. One of the most important things that emerges for me in viewing the new footage is, as Shona identified, that these films are a testament to the communities of their inhabitants at present. They are versions of how the participants see their communities as they are at present. Much of the archive footage that they viewed first was made by outsiders to the communities for the purposes of marketing the area, or as a news feature. Some footage though, such as a portion of the work shown in Ullapool, comes from personal archives of amateur filmmakers from the past deposited in the National Library of Scotland’s Moving Image Archive. The new films are versions of the towns and settlements as they see them now. It’s the participant’s reality, their way of seeing at this present moment. They’ve chosen to keep the shots that make up the final films in the edit. They lose the ones they don’t like and keep the ones that they do, and place them where they want them to be in a sequence that makes sense to them. The main aim of the project is to create straight observational films that capture the communities as they are at present. This process generates a lot of footage. There are many out-takes, mistakes and scrappy bits of film that at first don’t appear to have much use. As the participants learn to use the cameras, and mess about with them, they capture all sorts of moments that pass in the blink of an eye. They capture their way of interacting with each other, they share a little moment of their own personality almost by accident. Added up together these previously discarded elements lead to something very interesting. They reminded me of something, something I couldn’t quite put my finger on. Earlier in the year the Lithuanian – American filmmaker Jonas Mekas died. Mekas was an outsider to the mainstream world of film. His work, as I understand it, was a reaction to the dominant trends of film. He’s a significant figure in the world of avant-garde filmmaking. The first time I came across his work was on seeing an excerpt of Walden as part of the Cinema Cent Ans de Jeunesse / Understanding Cinema project. I hated it. I couldn’t understand what the point of it was. It was so jumpy, so imperfect, so frantic, it contained too much information in too short an amount of time. It was totally alien to me. It annoyed me so much that I went back and watched it again. And again. And again. Something about it had got me. Mekas had his hooks in me. The more I looked at it the more I understood, or hope I understood, what he was trying to do. By using so much footage in rhythmic blasts, overlaying bits one on top of another, he created a profound sensational response in the viewer. You get the feeling of a place, a time, the characters, the essence of it. It’s extremely fine work. It’s cinema like I’d never seen before. He’s painting with images like a pointillist might. It’s utterly brilliant. It’s too fast for you to have a rational response to it, your primary engagement with it is sensory, then in reflection you have a cerebral response where you try to rationally understand what you’ve seen and felt. It’s a kind of magic. On his passing I went looking for some more of his work online and found excerpts here and there. One piece in particular stood out – As I Was Moving Ahead, Occasionally I Saw Brief Glimpses of Beauty. In this piece he narrates a series of personal reflections about the creation of the work and his relationship with it, and to those on screen and the world at large. It’s very poetic and rather full on. I loved it. As I reviewed the footage from the Made by the Sea project it suddenly struck me that some of it may be appropriate for a Mekas style treatment. Mekas was working from footage in his own archive, and it presents us with a version of a world now passed, so it’s ideal for a project like ours. I identified a group of clips and dropped them down into the timeline of Final Cut. A series of clips that ran to 18 minutes condensed nicely down to just under two minutes at x200 speed. It was remarkable. Something other than I had expected emerged. There was a flavour of the group themselves. Them at this moment in time. It was as if something of their interactions was revealed by being removed from real time and sped up. I know it’s heresy as a filmmaker to say this, but I often feel that a film seen in fast forward reveals its secrets very clearly. If I’m trying to understand a film, particularly of a filmmaker whose work plays about with form, such as Peter Greenaway, I’ll scan through the film in fast forward (usually after viewing the film…). You can see the blocking emerging very quickly, the use of shots and colour seem to stand out more definitely and you can get a quicker picture of what they were trying to do. Obviously this is a simple means of analysis, but it’s quite effective to give you a quick grasp on certain aspects of a filmmakers’ work. Working virtually with Barra and in person with Ullapool and Tobermory, I pointed the participants in the direction of the As I Was Looking Ahead I Saw Brief Glimpses of Beauty clip. Their feedback was mostly very positive. 75 percent of them loved it, the remainder had a stronger, negative reaction. When I asked the groups if they would be happy to make a Mekas style film with some of their footage they said yes. Before the sessions I organised the footage into Mekas style collections and more traditional observational film collections. Working with the groups in person I got them to drop the Mekas style collections onto the timeline and speed it up by 200%. Each group identified this was too fast for them. They all elected to take the speed down to 80% faster then it was. On reviewing the films at this speed they then organised the footage in the order they wanted it to play. For one group it was from dark to light, for another from sea to air. They identified clips within the films and then took the sound out of them at normal speed, then sped the footage back up again, so as to make a coherent soundtrack. What’s emerged from these films, particularly the work of the school groups, is a testimony to the participants at a particular moment in time. It’s like we’re getting great big blasts of their experiences through film. The frenzy of being a teenager, the mad interplay of group dynamics, the fun of being together in locations they know intimately. Their distance from reality, through speed, renders them poetic, and more somehow more personal. Their reactions on seeing their Mekas films was great, they got it, they understood what they wanted to do and they did it. They’re making avant-garde films and relishing it. Thank you to Regional Screen Scotland and Highlands and Islands Enterprise for their support and funding in the delivery of this project. Grateful thanks to: Yvonne Boa and Ruth Thopmson and the staff at Ullapool High School; The staff of Castlebay School, Suzanne Forman and Rob Rhodes in particular; Andi Stevens, Flora Thomasson and the parents from Mull Youth Theatre (it’s so lovely to work at home on Mull, thanks for making it happen!). Thank you to Shona, too, for inviting me to come on this wonderful journey with you. The observational shorts, Mekas style films, phantom rides and other assorted pieces from Made by the Sea will be shared on line here at alsatch.com in the coming weeks.